Open-Heart Christmas • Run Hard. Rest Well. With Christmas only days away, are you feeling distant and depleted? Re-write your story. Begin with today. Startled, we all looked at her absolutely confused. The question for us today, no matter the degree of our worn and weary soul . 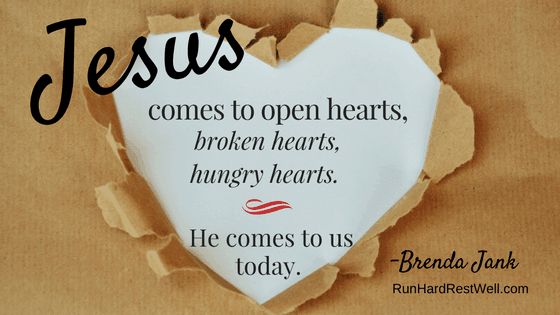 . .
Will you insert Jesus into your heart TODAY? The options and possibilities are endless. Kneel tonight when you pray. Say no to something trivial. Say yes to something important. Hold hands with someone you love. Read each Christmas card as a love note from Jesus. Ask Jesus to lead the way. He comes to open hearts. Broken hearts. Hungry hearts. To your heart and mine. Beginning today, make it an open-heart Christmas. Oh thank you! Just what I need to hear! Mine is a grieving heart. So, open heart to Jesus… Give him my grief. He promises to heal, even where regret has cut deep. Thank you! God moves at all times, and some of these Christmas devos are written weeks or months before December arrives. God knew I needed this one, this week, too. Grief was not at the forefront of my life when December began, but some very painful new realities are mingling with some on-going grief work. Jesus and I have a date this Friday. I need some extra time with him. It’s only going to be a couple hours, but my broken, open heart is ready and waiting for his arrival in a fresh way for every tear and heartache. Lifting up a prayer for you right now. Christmas has always been a disappointment for me. I never wanted the “stuff”. What I wanted was time with my family. Time where I knew I was important to someone. They showed me my worth through presents, and I’m not knocking gifts, but I wanted to know I was love, I was wanted. But going outside and riding bikes together, playing football, baseball, basketball with family would have meant the world to me. One day it will be different. For now, I breathe, and love, and keep on seeing, smiling, acknowledging others. Betty, Christmas is full of so many vying emotions, joys, disappointments. It’s often the “messy middle” of life. And we live, eyes on Him, in the messy middle. May we hear the angels sing!